Nature lovers are sure to find that Belvedere Pineta is the perfect place to stay, as this campsite can be found nestled in a pretty pine forest. A gorgeous sandy beach is also just a short stroll away, while the site boasts activities and amenities for the whole family to enjoy. Lovers of luxury camping can hire and follow the well-worn cycling paths that lead along the beach and through the pine forest. 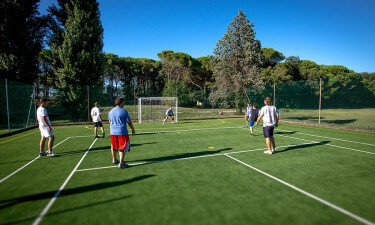 The site also boasts a large park where guests can take part in a number of sports and other activities such as football, tennis and yoga. 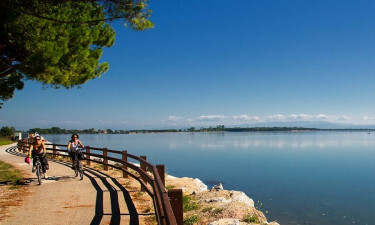 Why choose Camping Belvedere Pineta? The kids are sure to love the waterslide that leads to the site’s main swimming pool as it has been created in the shape of a snake. 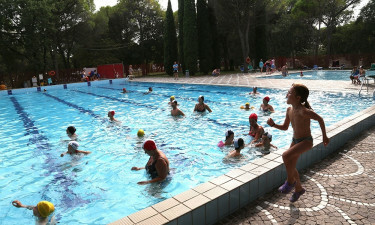 The pool also offers plenty of space for those who want to swim laps. Guests will be able to spend plenty of time on the beach, as they will find a stretch of golden sand just a short stroll from their mobile home. In addition to soaking up the sun, guests can enjoy beach volleyball here as well as a range of water sports. LuxCamp will be happy to help you with your booking.